FREE Parking,FREE ultra speed WI-FI,FREE Breakfast ! In the heart of historic old town district, just 4 minutes away from the city's main pedestrian street, Hostel Old Plovdiv is a real architectural marvel. 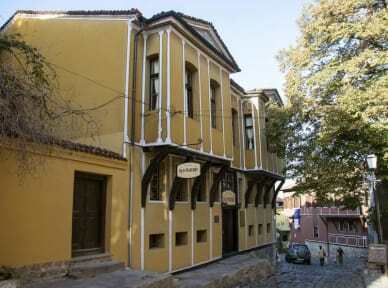 Build in 1868, the house, where Hostel “Old Plovdiv” is located, belonged to one of the richest local tobacco merchants. 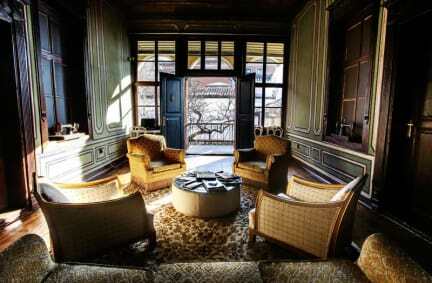 The 130-year old wooden floors and the 4 metres high ceilings and big windows will take you back in time of the Bulgarian Renaissance. Furnished with authentic antique beds and wardrobes, purchased from local antique shops and renovated by professional restorers in the local Renaissance style, our 9 spacious and cosy rooms will seduce you with luxury at affordable price. With only 3 or 4 beds in every room we offer intimacy and comfort, which will make you feel at home. You will be amazed to see an original Roman fortress wall in the middle of our dining room! The front desk is really friendly and warm. Don’t wake up too late, you’ll never wanna miss the breakfast! I had my best stay in this Hostel! It is located exactly in the old town! The room is beautiful, big and cozy! The yard is so cute! The most impressive thing is, the two reception guys are super nice, super helpful and super cute! Everything's perfect during my stay in this hostel!